"It's not all the same"
Pro-electorial materials "It's not all the same" dealing is organized for the second time in the centre of the town. Citizens' reactions were positivly again. "Preparation for the European integration"
The citizens were interested in European standards about national minorities and Police civic control. Tonight is held a post-electorial Candidates Forum. This ocassion, conversation was in round table form with elected representatives in Parliament of Vojvodina. In very dinamic discusion relevant topics were analized regarding authonomy of Vojvodina as well as co-operation between new government and NGOs. Today has started pro-electorial campaign "It's not all the same". 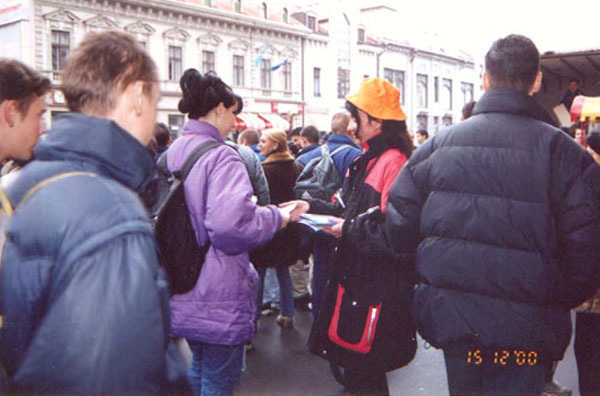 In the centre of the town is distributed big amount of booklets and stickers clearly undersigned by European Movement in Serbia. Representatives of the "Balkan Community Initiatives Fund", "Mott Foundation" and "King Baudoen" foundations have visited European Movement in Zrenjanin. The main goal of their visiting is informing about working and results of NGOs working in the Region. Their expertise will be presented both at their organizations and at other organizations who are interested for helping our Region. Their foundation are oriented for supporting long-term projects, because they believe that kind of projects are more successful than short-term ones. 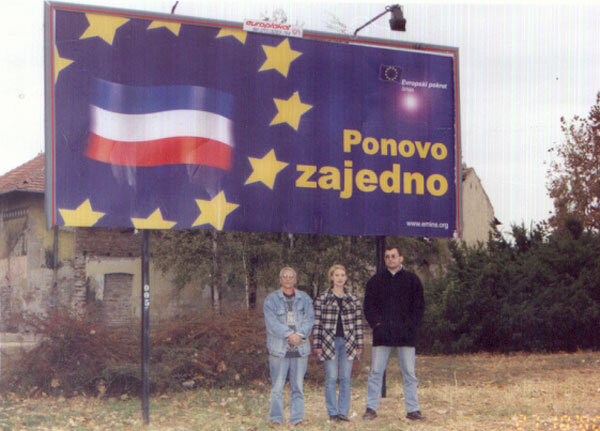 The bilboards of European Movement in Serbia are appeared in our town. On two spots beside "motorway" is clear message "Together again", like sorrow for lost times and hope in better future. 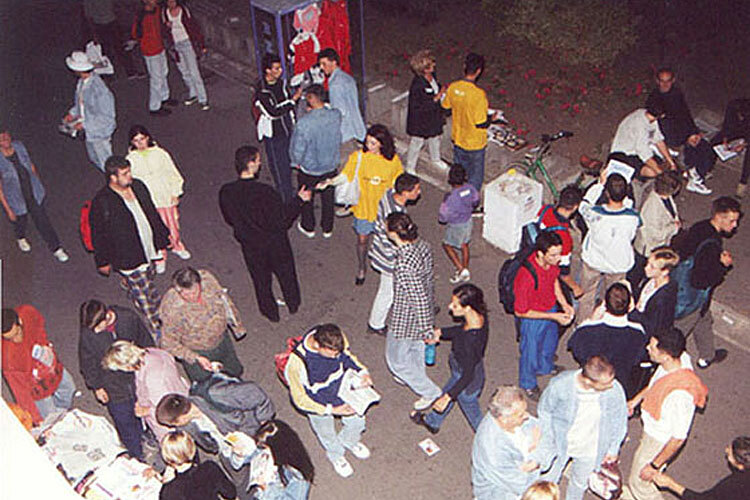 In late evening hours on the Freedom Square from European Movements members was snatched away big amount of different materials regarding to actual post-electoral situation. Leaflets, stickers, paper finger posts, condoms etc. escaped for moments. Local Council of European Movement held Fourth session of Candidates Forum. 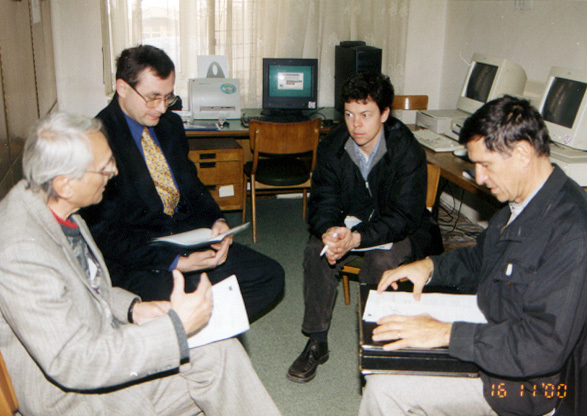 Miodrag Maksic (DOS), Sandor Somogyi (Vojvodina Movement) and DuĹˇan Ĺ ijan (Radical Party) are presented themselves and their parties programs for Vojvodina Parliament seats. Other parties didnâ€™t send their candidates for this Forum. Pro-electoral activities undertaken by Local Council of European Movement are over with this Forum. Local Council of European Movement held Third session of Candidates Forum. Aca Antin (DOS) and Predrag Korac (Party of Natural Law) are presented themselves and their parties programs for Local Parliament. Other candidates from this electoral unit didnâ€™t show up. "Vote and rock the Boat"
In the center of the town was distributed big amount of different pro-electoral materials into â€śVote and rock the Boatâ€ť youth campaign. Hats, T-shirts, leaflets, stickers, pencils, balloons, posters etc. are simply snatched away from our members. After half of hour whole center was â€śwavingâ€ť. 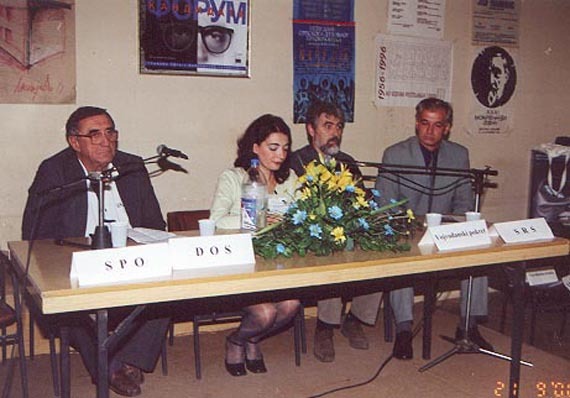 Local Council of European Movement held Second session of Candidates Forum. 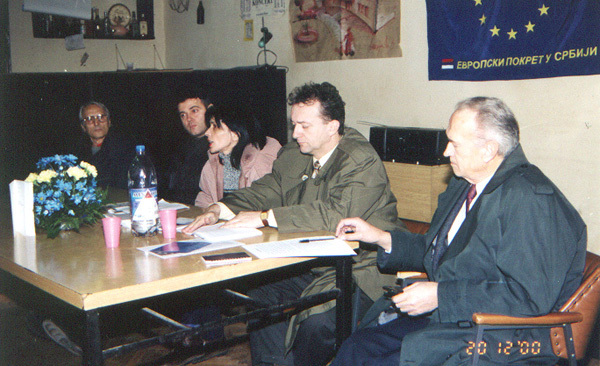 Sredoje Mihajlov (DOS), Elvira Rosivald-Hangya (Vojvodina Party) and Dragan Radojcin (Radical Party) are presented themselves and their parties programs for Local Parliament. Other candidates from this electoral unit didnâ€™t show up. 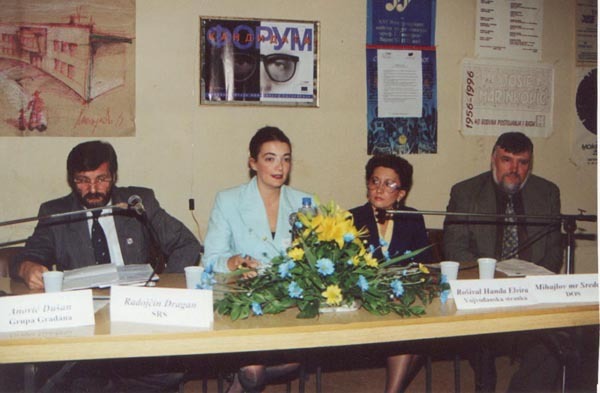 Local Council of European Movement held First session of Candidates Forum. 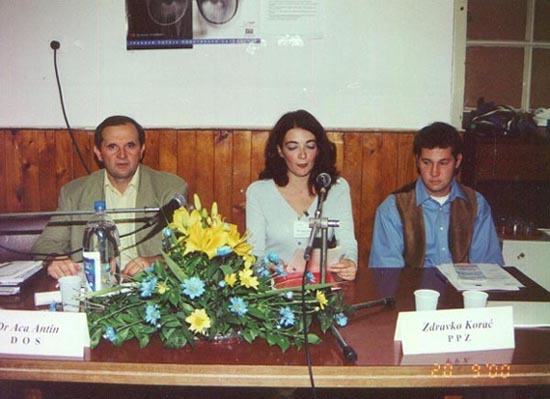 Vojislav DoĹˇen (DOS), Nikola TomaĹˇev (Vojvodina Party) and Rozalija Zonai (Vojvodina Movement) are presented themselves and their parties programs for Local Parliament. Other candidates from this electoral unit didnâ€™t show up. In fulfilled big hall of Cultural Center actors Ljubivoje Tadic and Branko Vidakovic presented themselves in â€śDialogue in Hellâ€ť performance. The audience was shocked by fantastic coincidence of theme from last century and present situation in Serbia who forced to take a deep look into their own conscience. After the performance was held the voting for one of the main characters in performance. The winner was character who symbolizes distribution in power. After that citizens have had an opportunity to talk with actors as well as with director and composer of the performance. Local Council of European Movement helped this performance. On joint meeting of local NGOs, the agreement has established regarding to elections we are facing, named EXIT 2000! European movement in Zrenjanin will realize its pro-electoral projects through this Zrenjanin's NGO pool, together with other local NGOs. The office of EMiS in Zrenjanin are visited by V.Batic, one of the United for changes' leaders. It was talked about situation in Third sector in Zrenjanin and EMiS in Zrenjanin role in civil society developing. The Local council of EMiS organized the celebration of the Day of Europe. In the main part of program the choirs of Zrenjanin "Emanuel", "Prepodobni Rafailo Banatski", and "Sveti Serafim Sarovski" held a concert of spiritual music in the reformatic's church. The local council of EMiS together with the Civic initiative from Belgrade held a tribune "Fight for elections". 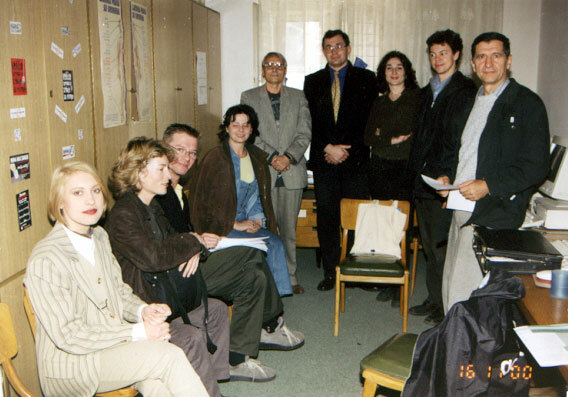 The guests were Vladimir Goati, Ph.D., Institute for Social Sciences Belgrade; Marko Blagojevic, Center for free and democratic elections, Belgrade; Danica Vucinic, Radio B292. The Workshop of the Local council of EMiS in Zrenjanin on social marketing by Internet and global joining of NGOs also by Internet, held by Dragan Varagic, Internet consultant from Novi Sad. 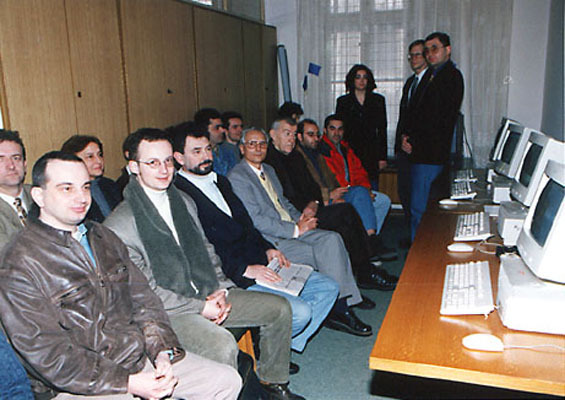 The web sites of European movement in Serbia and the Local council of EMiS in Zrenjanin are presented as well. The presentation of the document "Yugoslavia by the end of the century: how to join Europe and the world?" 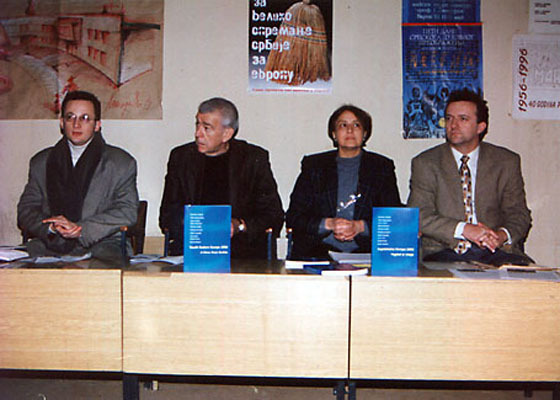 prepared by Forum for international relations and the book "SouthEastern Europe 2000: A view from Serbia" was promoted.